In this tutorial, we will create a simple Voting dapp (very similar to our popular ‘Hello world voting dapp’ many of you might know!). The Solidity contract will be the same but we will use Ethers.js instead of Web3.js for the frontend. The application is extremely simple, all it does is initialize a set of candidates, let anyone vote for those candidates and display the total votes received by each candidate. If you are new to Ethereum, here are some courses that can help you get started. If you have already worked through the ‘Hello world voting dapp’, you can skip to Step 3. This is how I would visualize this application we are going to build. Instead of developing the app against the live blockchain, we will use an in- memory blockchain (think of it as a blockchain simulator) called ganache. Below are the steps to install ganache, ethersjs, solc (to compile our contract) and start the test blockchain on a macos. The exact same instructions work on linux as well. Notice that the ganache-cli creates 10 test accounts to play with automatically. These accounts come preloaded with 100 (fake) ethers. 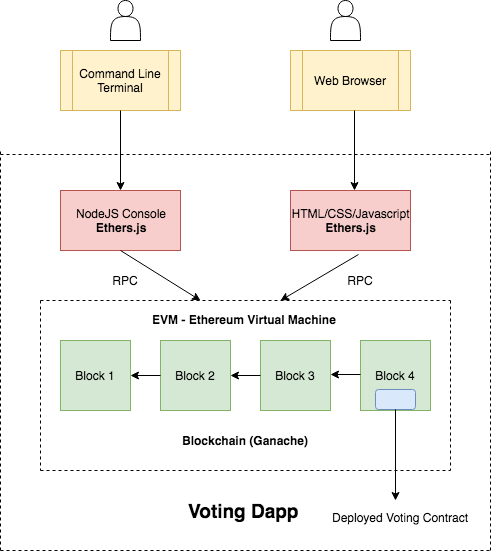 Copy the above code to a file named Voting.sol in the ethereum_voting_dapp/chapter1-ethersjs directory. Now let’s compile the code and deploy it to ganache blockchain. Follow the commands below to compile the contract. 1. Voting_sol_Voting.bin: This is the bytecode you get when the source code in Voting.sol is compiled. This is the code which will be deployed to the blockchain. We will now use ethersjs library to deploy our application and interact with it. Next is to initialize the provider which is a generic interface to connect to the blockchain. Since we are running the blockchain locally, we will use the JsonRPCProvider to connect to it. If you wanted to connect to a real blockchain, you have many other provider options. Once connected, you can test the connection by querying ganache and listing all the accounts. Running the below commands in your nodejs console should list 10 accounts. The next step is to initialize the signer which is used to sign the transactions. We can select which account we want to use (we have 10 accounts ganache in setup) by passing the index to getSigner as shown below. Once the wallet is intialized, create a contract factory and deploy the contract as shown. The deploy function takes an array of arguments that is passed to the constructor of the contract. In our case, we pass in the names of the candidates. We have to explicitly convert string to bytes32 because our contract takes bytes32 as argument. If you successfully deployed the contract, your contract object should have all the details of the deployed contract. There are hundreds of thousands of contracts deployed on the blockchain. So, how do you identify your contract in that blockchain? Answer: contract.address. When you have to interact with your contract, you need this deployed address and abi definition we talked about earlier. Try the above commands in your node console and you should see the vote count increment. Every time you vote for a candidate, you get back a transaction id: Example: ‘0xdedc7ae544c3dde74ab5a0b07422c5a51b5240603d31074f5b75c0ebc786bf53’ above). This transaction id is the proof that this transaction occurred and you can refer back to this at any time in the future. This transaction is immutable. This immutability is one of the big advantages of blockchains such as Ethereum. Now that most of the work is done, all we have to do now is create a simple html file with candidate names and invoke the voting commands (which we already tried and tested in the nodejs console) in a js file. Below you can find the html code and the js file. Drop both of them in the ethereum_voting_dapp/chapter1-ethersjs directory and open the index.html in your browser. You should now see the vote counts and you should also be able to vote for candidates. You can now go to localhost:8080 and interact with your application. Below is a quick demo which includes loading test ether account into metamask. I hope you were able to follow along and get the application working. Check out Zastrin.com, and sign-up to get more tutorials and lessons so you can build and deploy real working dApps. Start contributing to the community and decentralization, and become a Zastrin developer. If you run into issues getting the application working, feel free to DM me on twitter @zastrinlab or email mahesh@zastrin.com.